The Thoroughbred Retirement Foundation (TRF) has secured a $50,000 matching gift challenge from the Geoffrey Hughes Foundation (GHF) to launch its 2017 Hay Drive. The GHF will match every gift received by the TRF up to $50,000 for its Hay Drive campaign which launches September 11, 2017. 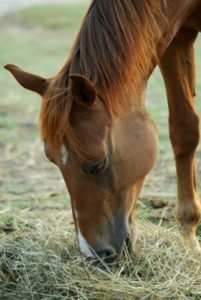 The TRF’s goal for the 2017 Hay Drive is $300,000 to cover the cost of hay for the close to 800 horses in its care throughout the winter of 2017-2018. 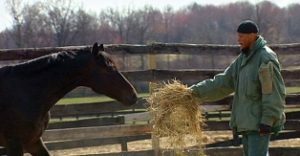 The TRF Hay Drive, in its eight consecutive year, is one of the most important campaigns for the organization which is entering its 35th year of providing rehabilitation, retraining and retirement for Thoroughbreds no longer able to race. The campaign will be conducted by direct mail, email and social media as well as one-on-one donation requests. The Geoffrey C. Hughes Foundation, was established in 1991 and focuses on causes that were important to Mr. Hughes in his lifetime.